The Petrovs contemplate their future in Australia after defection. Image courtesy of the Herald and Weekly Times. Vladimir Petrov rose from humble peasant origins to become a Soviet intelligence agent and the Third Secretary at the Soviet Embassy in Canberra. 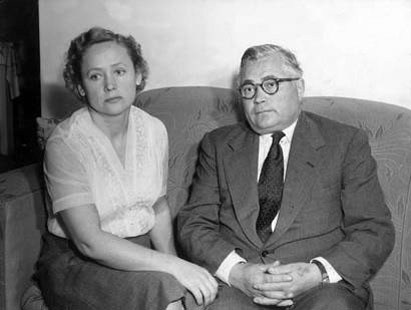 Petrov’s role in Australia was to spy on Soviet citizens, to infiltrate and destabilise anti-Soviet emigré communities and to obtain general political intelligence. Petrov failed to develop the spy network in Australia, was associated with the deposed Russian security chief, Beria, and had received several unfavourable reports. As a result he would not have expected a happy return to Russia and came to see defection as his only option. After much torturous soul searching he finally chose to defect on 3 April 1954. Evdokia was Petrov’s wife. She also was a Soviet intelligence officer specialising in ciphers and worked at the Soviet Embassy. Less than two weeks after her husband defected Evdokia Petrov was taken to Mascot airport in Sydney to board a flight back to Russia. Anti-communist protestors, including many immigrants from Eastern European Communist countries, tried to prevent her leaving. A common misconception surrounding the Petrov Affair is that scenes at Mascot Airport show Evdokia Petrov being forcibly dragged to the plane. However, Mrs Petrov did not intend to defect at Mascot. It was the crowd and not her Russian couriers that she was afraid of. Evdokia Petrov decided to defect on 20 April 1954 in Darwin. She feared for the safety of her family in Russia but many years later was eventually reunited with her sister, who emigrated to Australia in 1990.